The house is almost finished. We should be moving in this Saturday. People that want to help with the move are welcome to contact us. David is still working out and getting stronger. Earlier this week he showed me that he could move his abs a little. This is awesome because it is well below his level of injury. GO DAVE! On Sunday, February the 10th, David will be dropping the puck to start the Boston Bruins Alumni Classic Game at Saint Anselm College in Manchester, New Hampshire. Admission is $10. All proceeds go the CMARS program at Crotched Mountain. 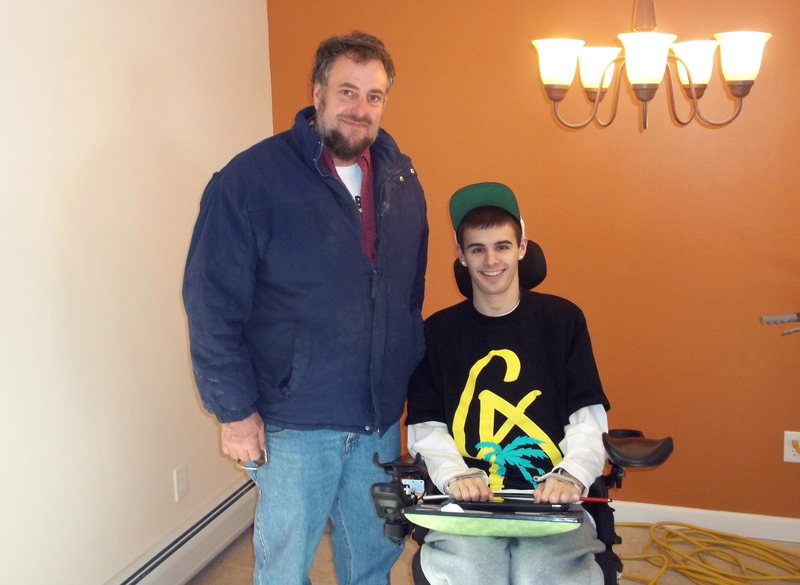 CMARS are the people that helped David get back on snow after his injury. To learn more about CMARS and the Boston Bruins Alumni Classic go to DavidsJourneyToRecovery.com. This past Friday was a special day for David. 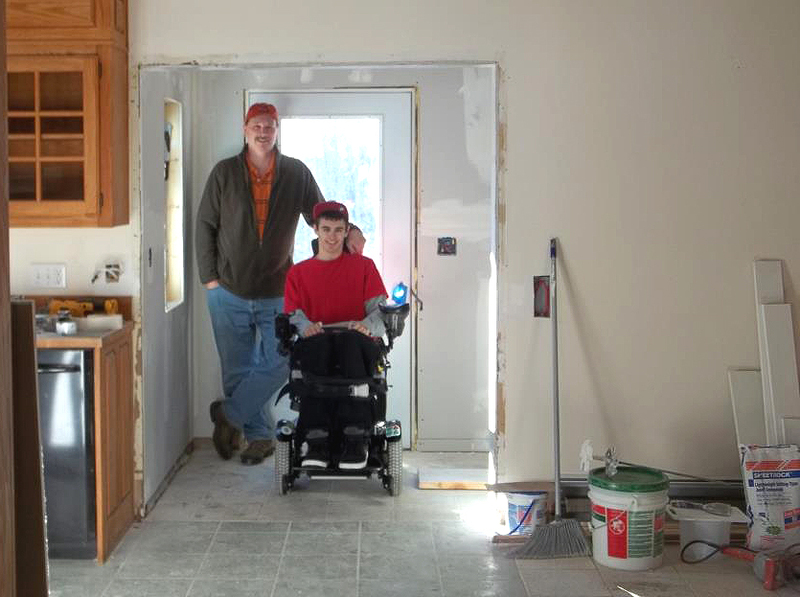 David Williams, the general contractor on our home renovation project, has been wanting to meet David, and David has been wanting to meet David Williams. However, because of schedules the two have not caught up with each other. By chance, the two caught up with each other on Friday during lunch. I went up to the house with some friends to show them the progress on the renovations. David Williams saw my car so he stopped in to bring me up to date on the renovation and to our surprise David got out of school early and wanted to take a look at the house with his mother so they stopped in. David Williams has done a great job. He sees the details and comes up with practical solutions that most contractors would not take the time to address. For example, the hallway floor is a half inch higher than the floor in David’s room. So David wouldn’t have to go over the bump over and over again he shaved it down so it was smooth. He is very much like the guy in the home improvement TV show Holmes on Homes. He does it right so that it will last. It looks like we will be moving in next Saturday. There is a lot to get done. We have to pack up and clean the apartment we are in, and clean and move into our newly renovated house out on Old Walpole Road. Help! If you would like to help us move, let us know. Email me at: phudgik@gmail.com. A lot going on in a short period of time. We thank everyone for their support. We would not have been able to get this project done without your help, support and prayers. David will be dropping the puck at the Boston Bruins Alumni Classic on February 10th at Saint Anselm College in Manchester, NH. Mark your calendar for Sunday, February 10th. On that date David will be dropping the puck to start the Hockey Benefit Game between the Legends of the Boston Bruins Alumni and the mighty Crotched Mountain Wild. 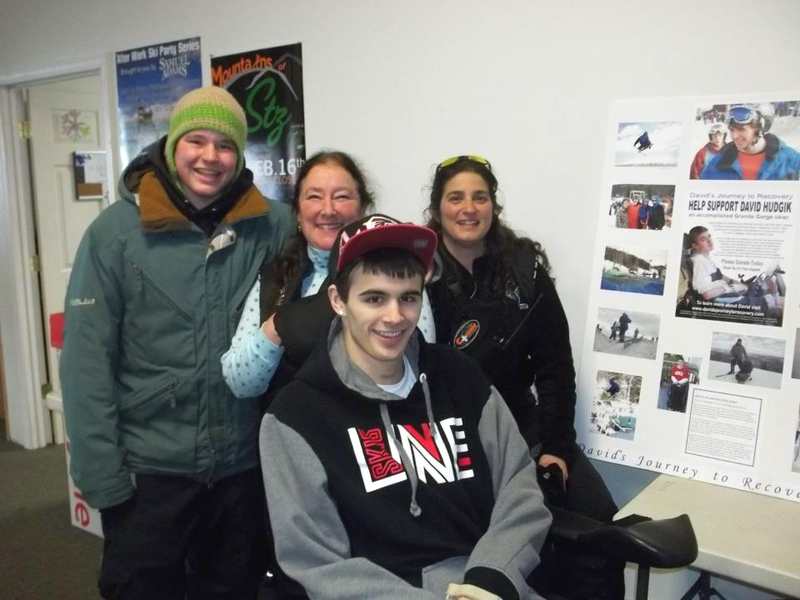 CMARS provides hundreds of lessons each year for children and adults with disabilities to safely learn to ski and snowboard, kayak and canoe, cycle and hike and participate in other recreational sports with the support of adaptive equipment. The Bruins Alumi team is drawn from a roster that includes Bruins legends Terry O’Reilly, Brad Park, Reggie Lemelin, Bruce Shoebottom, Rick Middleton and many more. Players will be on-hand for autographs. Raffle prizes include autographed sports memorabilia, sporting event tickets and a chance to participate in on-ice games between the periods. Lots of fun for everyone. Sunday, February 10, 2013 at 2:00 p.m.
David would love to see as many of his friends, family and supporters at this game has possible. David and family went up to Granite Gorge yesterday. We dropped off an updated information poster for the Donation Jug they have in the lobby to raise funds for David. It was great to see all of our ski friends up at the mountain. If you get a chance take a trip up to GG. They have great local family skiing and tubing. Check out their new cafe. We did for a quick snack. Excellent wings, finger foods and more! While you are there drop a couple of $$ or any spare change you may have in David’s Jug. 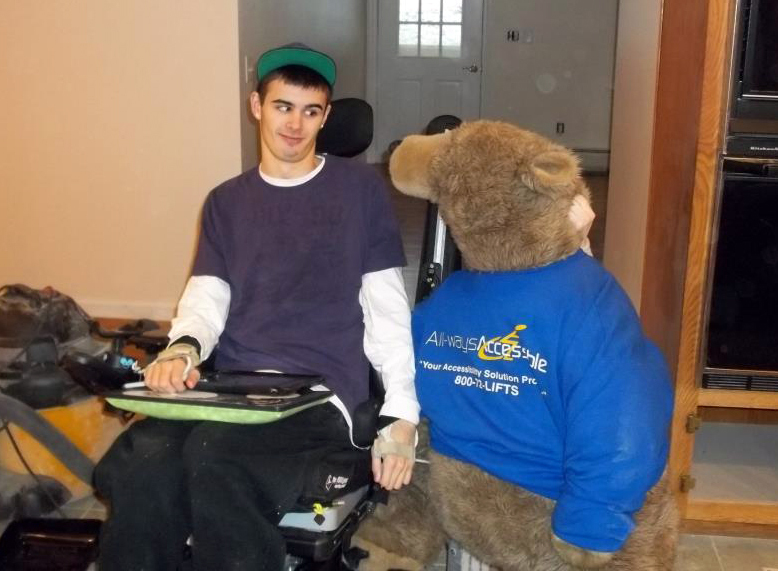 It would be greatly appreciated and will get David closer to obtaining a manual wheelchair and more independence. To help with fund raising, you too can place one of David’s Jugs at your place of work or worship, retail stores, restaurants and schools. Just let us know. We will provide you with posters, jugs and any other material you may need. For more information go to David’s Website at: DavidsJourneytoRecovery.com. David continues to work out on a regular basis. He is very much looking forward to getting into his new home. The house should be finished in a couple of weeks. The elevator is going in next week. The electrical work, painting and the floors need to be finished and then we will be ready to go. We are looking for volunteers to start getting lined up for the move. The big move will probably be the last weekend in January. We will get more information out on that shortly. The attached picture of David with Ryan, Dawn and Diana was taken at Granite Gorge this Saturday. We are saying goodbye to 2012 and are very much looking forward into 2013. 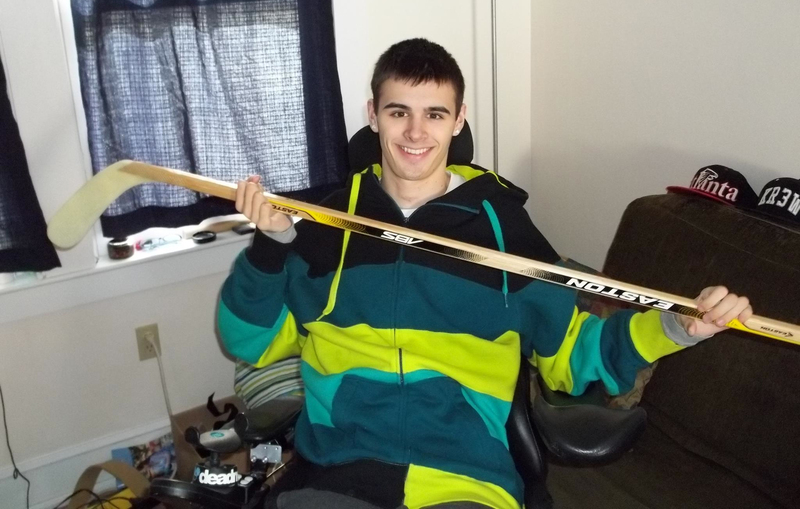 A quick look back at 2012 and we have a lot to be thankful for including many successful fundraisers, donations of time, equipment and funds all to help David become more independent. Thank you ALL! 1) GET ON SNOW ASAP! With your help, and David’s good nature and determination, I’m sure we will achieve many of these goals. David is still progressing. He is still going to high school on a daily basis, working out, and spending time with his friends. We did look into a therapy dog for him but it would just cost too much ($25,000). There are other more important things that he needs now such as physical therapy and a manual wheel chair. It looks like the chair that would work for him will cost over $6,000. The renovations at the house are still progressing. The finishing work is getting done now like painting, finishing the floors, getting the bathrooms complete, and getting the last of the electrical work done. The elevator should be in by the third week of this month and we expect to be in by the end of January. There will still be a lot of work that needs to be finished after that but most of that is on the outside of the house. Thank you all for your Love, Prayers and Continued Support! While out shopping yesterday a sheep, number 18, jumped up into David’s lap and instantaneoulsy fell asleep. Keep smiling and may all of your tomorrows be better than your yesterdays.